Are you ready for some trading cards? Pretty soon, I’ll be at RT, the Romantic Times convention. While I’m there I’ll be wandering around, hiding from the intense crowds, and talking to people I haven’t seen for a while. I’ll also be signing books and spending time in Club RT, plus I’ll be giving out some swag, including T-shirts, mugs, and now…. TADA! Trading cards. The lovely and talented Lex Valentine has been kind enough to design some St. Nacho’s trading cards and I’m looking forward to handing them out. 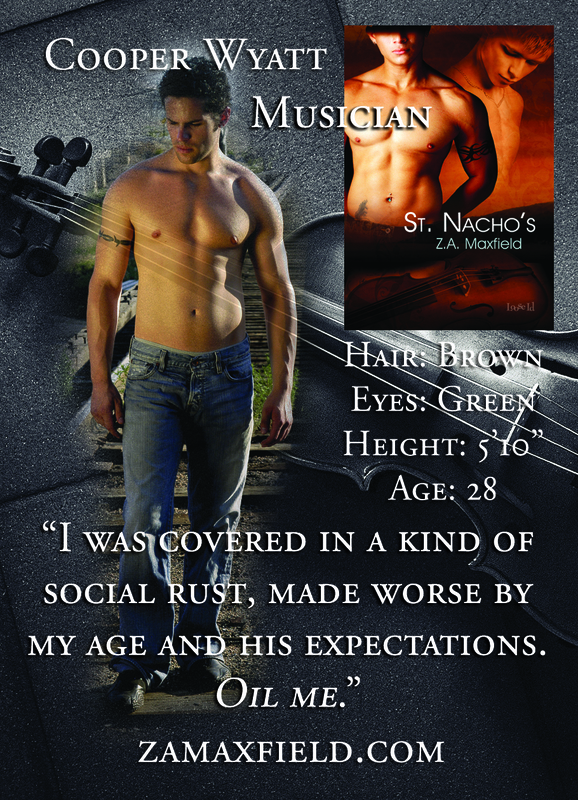 Here’s a sneak preview of the very first in the series, St. Nacho’s musician Cooper Wyatt.